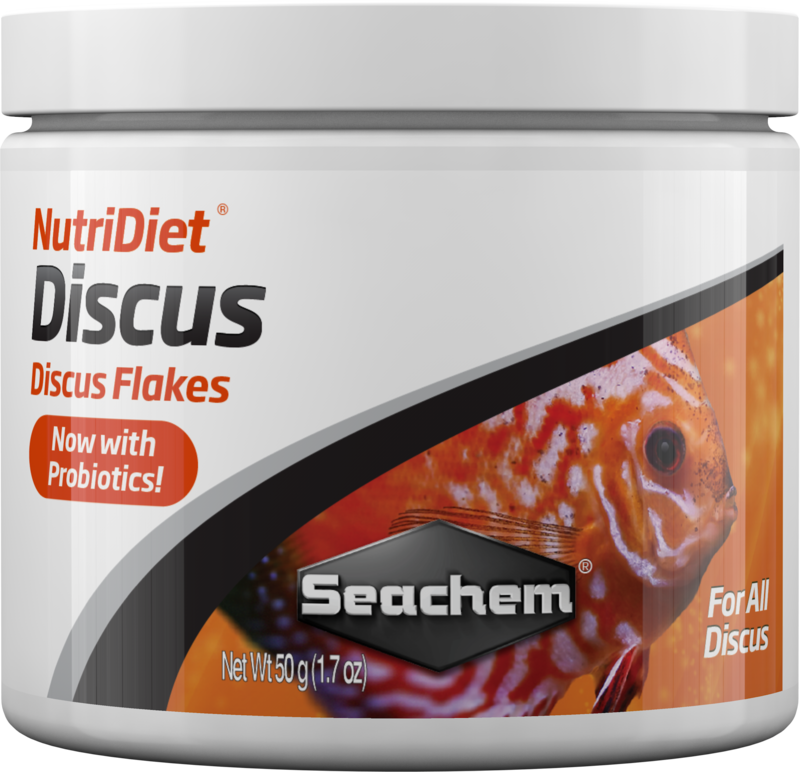 NutriDiet® Discus Flakes is a premium and nutritionally balanced diet formulated to meet the requirements of all discus. It contains only the highest quality ingredients including fish, squid, and earthworms. 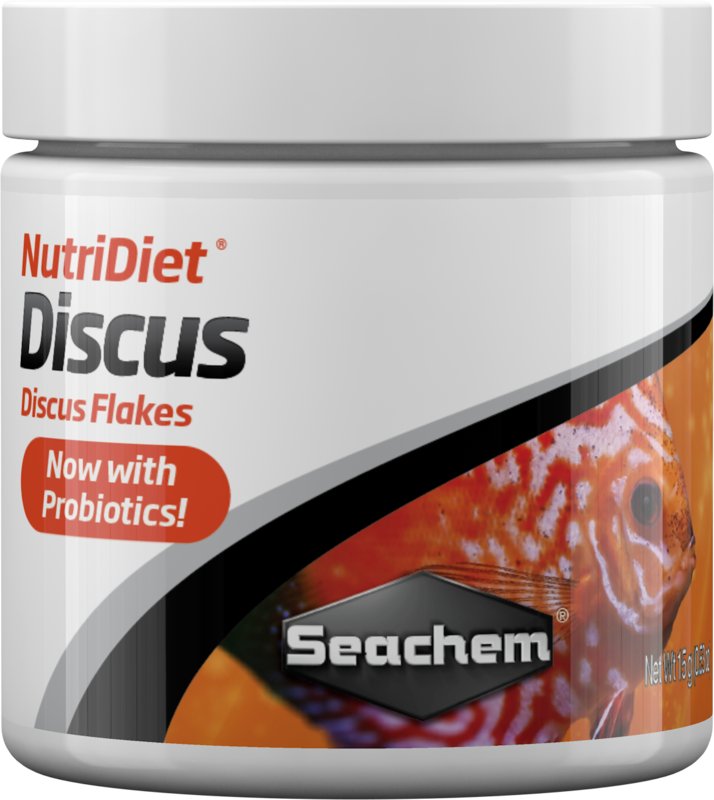 As with all of the Seachem NutriDiets, Discus Flakes have Chlorella Algae as an exceptional source of a broad range of vitamins, amino acids as well as all other nutrients required for animal life. Chlorella Algae is considered a potential super food that far surpasses the nutrients delivered by Spirulina Algae common to other diets. 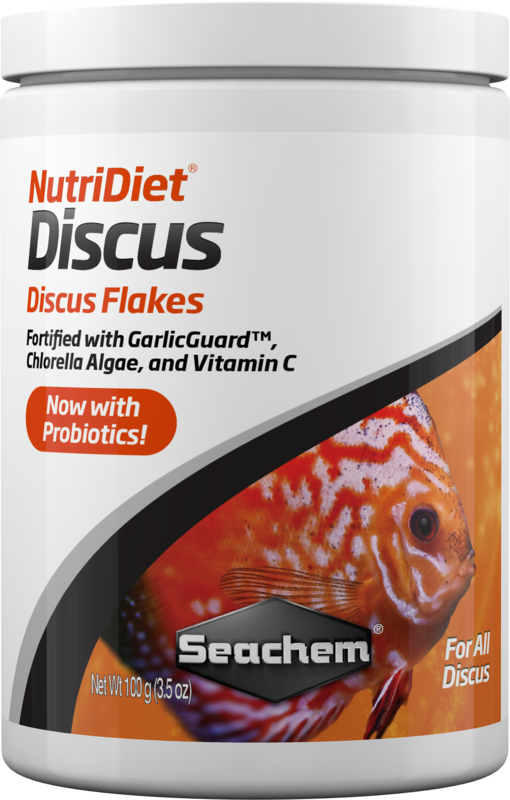 Additionally, Discus Flakes contain GarlicGuard™ as an appetite stimulant. Vitamin C allows for enhanced immune function and collagen production and thereby tissue repair and growth. Natural color enhancers assist in making the most of the potential color of any discus. 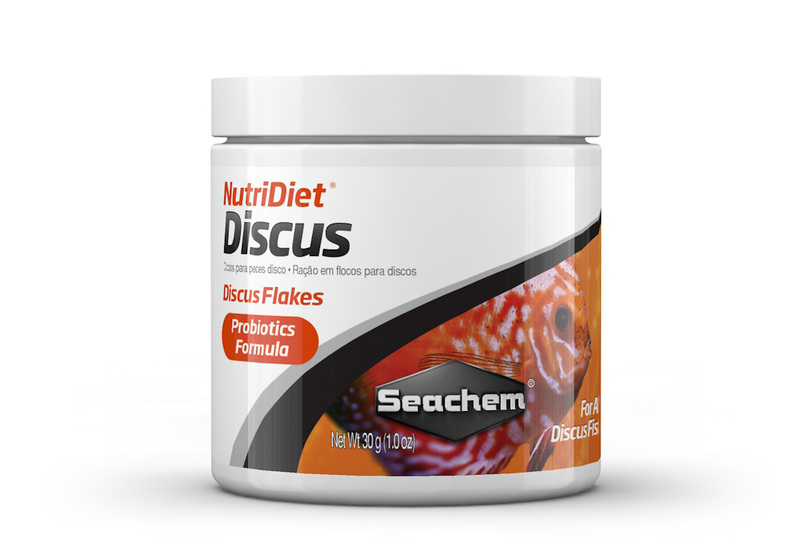 Discus Flakes also contain probiotics which allow for more rapid and simplistic digestion of the partner nutrients. Less energy is required by the fish to digest the food. 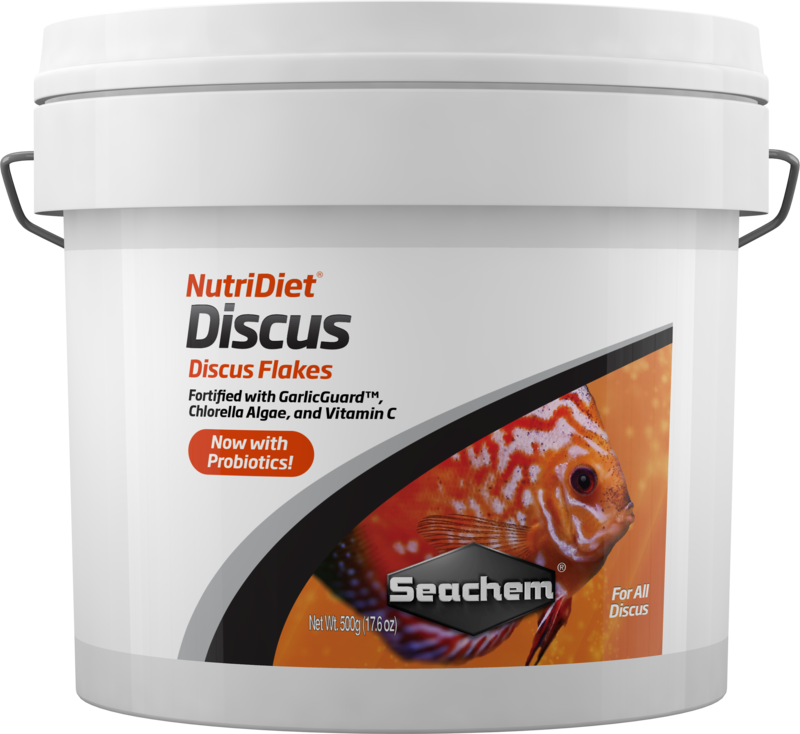 The food is more completely digested which reduces unnecessary waste in the system and better overall health of the discus. This also allows for more nutrient uptake and increased immune function. Lastly, patent pending compounds complete the formulation to enhance immune function further as well as extend life potential, promote natural growth, and enhance the color of fish. It is an attractive food source because, and has been deemed a “Super-Food” as it is high in protein and other essential nutrients. When dried; it is about 45% protein, 20% fat, 20% carbohydrate, 5% fiber, and abundant in minerals and vitamins and satisfies all of the requirements of a healthy and balanced fish diet as established by the National Academy of Sciences. It is the highest-known source of chlorophyll. While these are all beneficial, the greatest value of chlorella lies in a fascinating ingredient called Chlorella Growth Factor (CGF). CGF is a water soluble nucleotide-peptide complex found only in chlorella. It is responsible for the rapid rate of growth of the alga. Experiments with microorganisms and animals have shown that CGF promotes faster than normal growth without adverse side effects by naturally catalyzing the DNA to RNA to protein conversion. It stimulates tissue repair and protects cells against some toxic by-products of rapid growth. The process used in preparing Seachem chlorella products has been specially designed to maximize the CGF content retained in the final product. The effects of CFG are only observed in algae whose cell walls have been perforated, as the wall is composed of material that cannot be readily digested. The Seachem protocol breaks open the cell wall, allowing the cell contents to be fully available for digestion. Probiotics are microorganisms that when consumed, confer several health benefits. We use these ingredients to allow all of the NutriDiets® to be much more digestible with the use of less energy by the fish. This also means that the foods are more completely digested. This maximizes nutrient uptake while at the same time reducing waste into the system. Maximized nutrient uptake also enhances immune function. 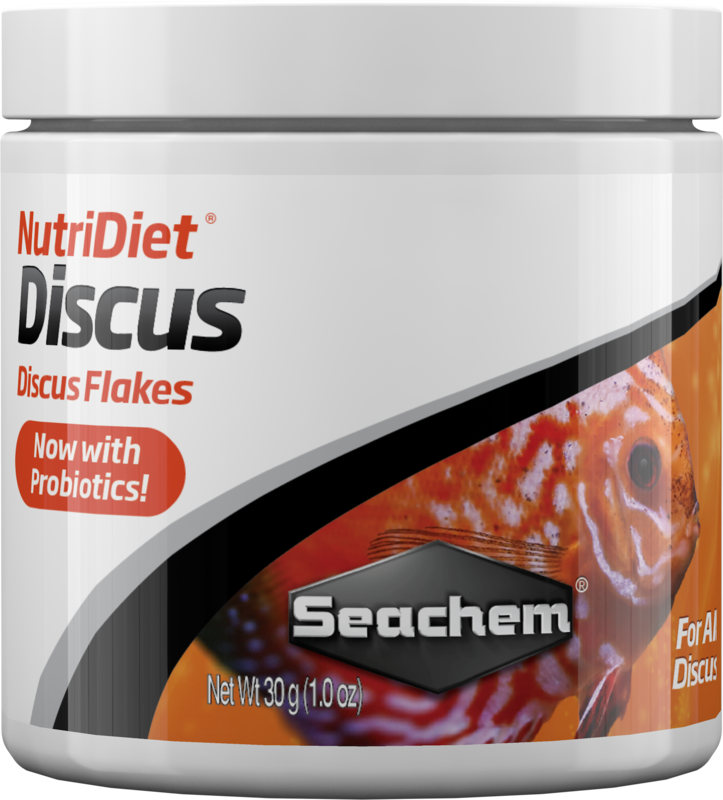 Seachem’s garlic-based product is added to all of the NutriDiet® flakes to enhance palatability with all fish. Garlic has a high vitamin C content. Garlic also affords the sulfur-containing compounds alliin, ajoene, diallyl polysulfides, vinyldithiins, and S-allylcysteine. Furthermore, it contains a phytoalexin (allixin). In addition, garlic has substantial amounts of beta-carotene, vitamins B1, B2, B3, B5, B6, B9, C, calcium, iron, magnesium, phosphorous, potassium, sodium, zinc, manganese and selenium. Vitamin C is a cofactor in the processes necessary for the formation of connective tissue, scar tissue in wound repair, and bone matrix. Vitamin C is difficult for fish to acquire in natural diets but is critical in addressing healing and growth issues in many fish. Vitamin C also allows for enhanced immune function. Feed 1-3 times daily. Feed as much as the fish will consume in three minutes of feeding. Contains a source of live (viable) naturally ocurring microorganisms.